Recently I’ve been using a Samsung Galaxy Tab 10.1, last year’s Samsung flagship tablet that runs Android HoneyComb (3.2). One of the browsers I was most curious to try was the Google Chrome browser that recently got an Android version but unfortunately it only runs on the latest 4.0 ICS (Ice Cream Sandwich) version of Android so it was a no-go. 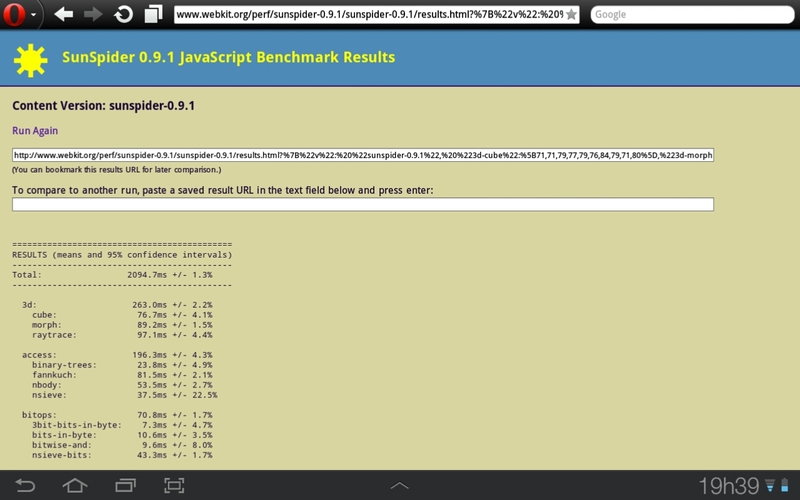 The stock Android HoneyComb web browser scored 2304.4 ms, so this can be seen as a base line for the other third-party browsers. 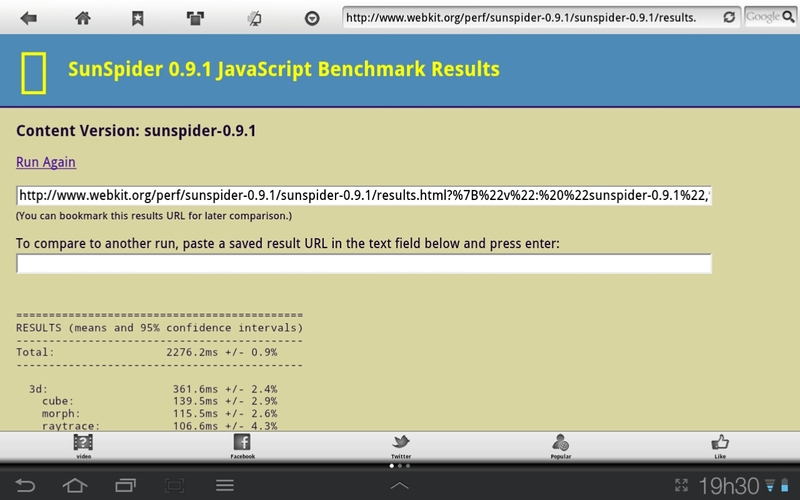 Mozilla’s Firefox, version 10.0.5, performed surprisingly good, running the test in 1883.4 ms, result that almost competes with the iPad 2 Safari result (that was around 1800 ms)! The Firefox Beta, currently available at the Play store in version 14.0, performed worst than the stable v10 version, completing the benchmark in 1983.4 ms.
Opera Mobile, currently at version 12.0, ran it in 2094.7 ms which, compared to Firefox, is not brilliant although better than the Android 3.2 stock browser. 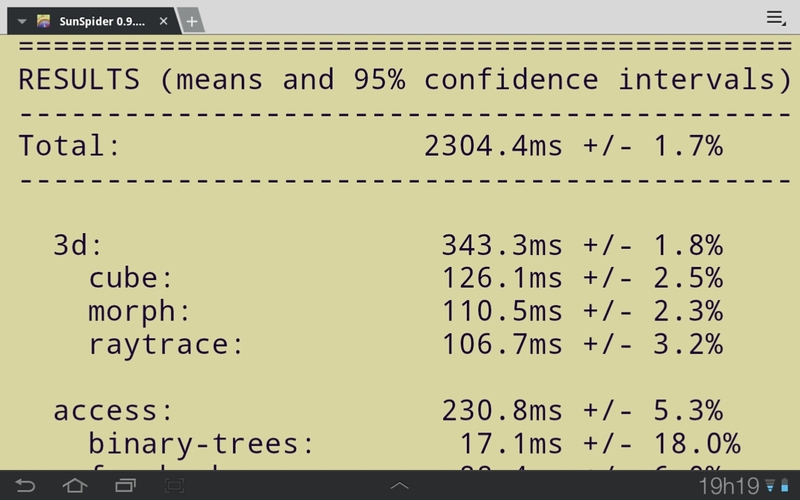 Finally, Skyfire 4.1.0 ran it in 2276.2 ms which is about the same as the stock browser, so, not a result to be particularly proud of. 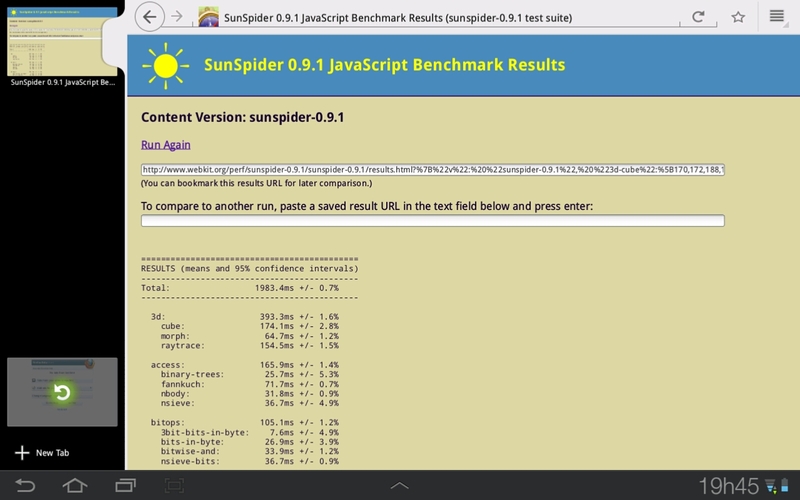 Although packing a Tegra 2 SoC and more RAM, the Galaxy Tab 10.1 does not beat the theoretically less powerful iPad 2, that’s still the king of my SunSpider tests on tablets, with a result as low as 1744.0 ms achieved with iOS 5.0.1. This entry was posted on June 15, 2012 at 14:00 and is filed under Android, Firefox, Opera, Samsung. You can follow any responses to this entry through the RSS 2.0 feed. You can leave a response, or trackback from your own site.